The Therapeutic Goods Administration asked an expert panel for advice on whether to follow the lead of these countries and today released its decision. Instead of banning the products, the TGA will write to all implant manufacturers, asking them to provide in-depth data on how many implants have been supplied as well as physical samples of the products within 10 days. “After receiving information from suppliers, the TGA will consider whether to suspend or cancel particular products from the Australian Register of Therapeutic Goods,” a spokesman said. Many patients have contacted the ABC saying they were not told about the risk of breast implant-associated anaplastic large cell lymphoma when their doctors discussed giving them textured implants. A female doctor, who did not want to be identified, had both breasts removed because of cancer and was given textured implants. She said her plastic surgeon never mentioned the potential risk. “Despite seeing a top plastic surgeon, my surgeon provided me with absolutely no information on [the possible link]. It was not mentioned once,” she said. Australian health regulators have urged doctors to use the Australian Breast Device Registry to record details of removal of implants and of ALCL cases. Currently about 10 per cent of surgeons do not use the register. Specialist plastic surgeons said that to be effective, the registry should be made mandatory. 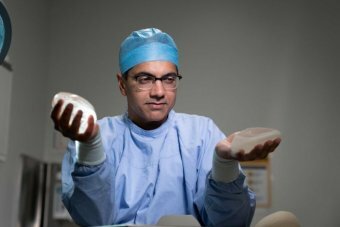 Australian Society of Plastic Surgeons president Professor Mark Ashton said a full register would allow clinicians to contact every woman with an affected implant, let them know whether they were at risk, and what action to take. “At the moment there are lots of patients out there who are saying: ‘Am I at risk? I don’t know what my implants are’ or ‘They gave me some information but I’ve lost it’, or ‘I don’t even know if I can find my surgeon’ or he might have died or moved on, or so forth,” he said.